On Wednesday, Denver will join other cities in America and abroad that have committed to ending deaths and serious injuries on their streets. About 60 people gathered at the steps of City Hall on Friday to show some love to Mayor Michael Hancock, who will officially launch a Vision Zero plan next week. The Vision Zero Coalition, a group of advocates who will watchdog the city’s efforts, called it a “love-in” — a sort of live valentine to Hancock. Friday’s event was light-hearted, but advocates know that the reason for the gathering is anything but. INC reps about 100 neighborhoods that united to demand Vision Zero last year. Noble joined leaders from the Transit Alliance, BikeDenver, and WalkDenver, who told the crowd why Vision Zero is a must. “We’re demonstrating today that the value of our people, the value of life is clear, and Denver residents want streets that are safe for all,” said Transit Alliance Executive Director Kathleen Osher. “We’re all pedestrians by design, but some of the most vulnerable pedestrians worth noting are children walking to school, seniors, people with disabilities, and people for whom walking is the only form of transportation that they can afford,” said WalkDenver Executive Director Gosia Kung. 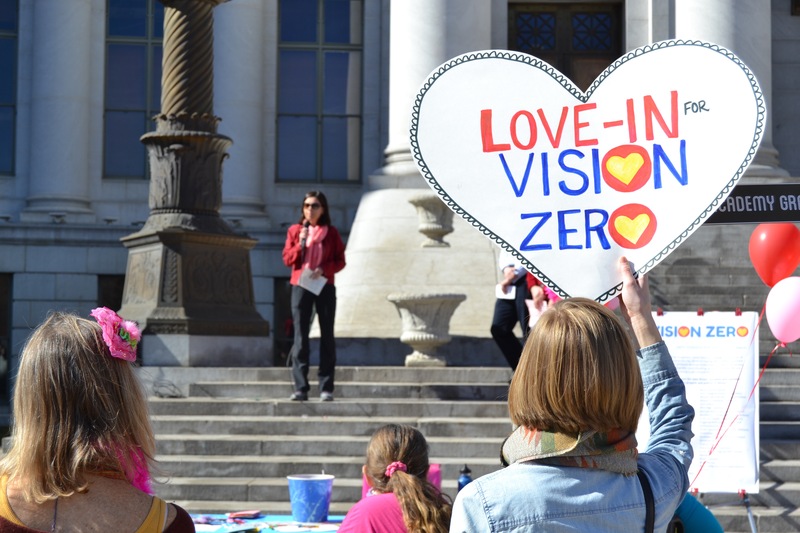 Advocates spoke about Vision Zero being the start of a culture change, or as Denver resident David Rapp put it, a new “muscle memory” for everyone. In its press release about next week’s announcement, Denver Public Works called Denver an “emerging leader” in Vision Zero, but it’s way too early to claim that status. Adopting the goal of zero deaths is just a first step. The real effort involves redesigning dangerous streets and reshaping policies to calm traffic and save lives. On Wednesday, when Hancock unveils the first bits of his Vision Zero plan, we’ll have a clearer idea of how he plans to act. Denver has a transit alliance? We could really use their advocacy on the colfax and broadway corridors. Hopefully Denver will do better on Vision Zero than New York. In New York City the DAs actively collude with the murderous drivers to make sure they can murder again.